Many of us are always rushing and running around between work, family, socializing, appointments and necessary shopping. Our to-do lists are never completely done and most days we feel like we just don't have the time to make a good meal for dinner. Enter Blue Apron and Green Chef. These companies ship meal supplies and recipes to your doorstep, so that all you have to do is follow the directions and enjoy a fabulous meal. I had been curious about using these services and when a friend shared a free offer with me to try Blue Apron, I thought, "What the heck" and gave it a go. At that price point ($0 USD), I didn't have anything to loose and I could evaluate how I really felt about the service and see if it added convenience to my busy life. 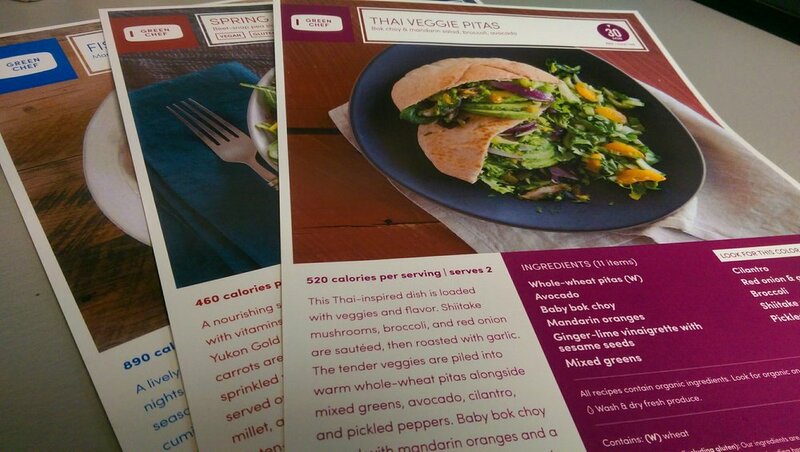 After trying Blue Apron out, I wanted to see how another option would compare and ordered three meals with Green Chef. My hope is to share my thoughts on each so then you can make an informed decision for yourself. There are definitely pros and cons to both, so there is no "right" answer - it's all about what is right for you. I will make sure to hit on the following topics as I review both in order to give as apples-to-apples of a comparison as possible: delivery method and time, packaging and organization, quality of ingredients, directions, ease of cooking, mise en place (French for "everything in place"), taste, ease of replicating and finally, cost. When my delivery from Blue Apron arrived in the afternoon on the date I had requested, I was really excited...more excited than I thought I would be. After all, here were all the ingredients for me to make three fantastic dishes and I was tickled to try something new. Upon opening, the box contained an outer layer of silver insulating material and then ice packs surrounding all the food. As I began taking the food out of the box, I noticed that everything was labeled with the same blue colored sticker and many items that didn't really need a plastic bag were in fact, in a plastic bag. I thought to myself, "I don't need the carrots in a plastic bag labeled carrots...they're friggin' carrots!". Now, since I have a friend who receives Blue Apron and have been present at her home for the unpacking ceremony before, I had a plan for how to organize the ingredients to make pulling them back out of my refrigerator easier. I laid them all out on the counter and grabbed three of my mesh produce bags that I use for grocery shopping. One recipe card at a time, I read the ingredients off and placed them into the bag. Now all I would have to do is take a bag out when ready to cook - easy enough. 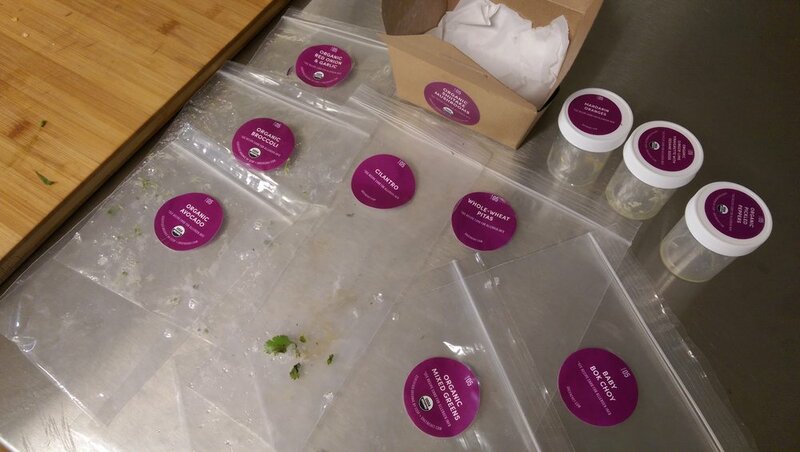 Blue Apron emphasizes high quality ingredients, but does not guarantee organic. Upon receiving the ingredients, other than the fact that I knew they were not organic, they all appeared to be very fresh and clean, which of course is appealing when you know you will be cooking with them. As the ingredients rested in my fridge waiting to be prepared, however, some items did wilt or begin to spoil due to the plastic packaging they were held in. You can see (above) that the recipe card has a nice description/history of the dish, lists a wine pairing (that you can have included in your order as well), all of the ingredients and what measurements are needed for each. Since I had implemented the bag system, when I was ready to cook, I just grabbed a bag from the fridge, got my mise en place and started the party. Darren was there to assist as sous chef and we read through the directions trying to determine who should do each task. As we began, we found that we were both a little stressed over the complexity of the directions and were having to re-read them over and over to make sure we had everything correctly. It was not a matter of the directions being unclear, but when you are unfamiliar with a recipe and there are many steps and ingredients, it can be overwhelming. A point of frustration with my Blue Apron ingredients was that I was missing two key items, which I hadn't noticed right away. First, I was missing a sweet potato for the Falafel Pita dish, which I realized as I was getting that dish organized. Luckily, I had a purple sweet potato left over from another dinner the previous week and I was able to use that. Second, on the Vegetable Laab dish, I was missing the soy glaze. This item would have been in the "Knick Knacks" bag (a brown paper bag holding many of the smaller ingredients for a dish), so I didn't notice this was missing until I opened that bag mid-way through the recipe preparation. I remember cussing in the kitchen and Darren called over to check in with me - "Everything alright, babe?". "No - I'm missing the damn soy-glaze and I just noticed it!". Knowing that I was in the middle and stopping the whole production would be wasteful, I decided to make up my own soy-glaze...although I have no idea what is actually in a soy-glaze. Thinking of the recipe as a whole and what would make soy sauce "glazey", I mixed some soy sauce and honey and hoped for the best. Oh, and I forgot to mention that the greek yogurt for the Falafel Pita sauce had opened and spilled over many ingredients when I first received my package. I mended it up and still made use of it, but that was fun to clean up :/. Although I experienced these snaffoos with the ingredients, each Blue Apron recipe was absolutely delicious! We would sit down after the stressful completion of what felt like a culinary marathon and were utterly surprised with the flavor of the meal we had prepared. Each time we agreed that the final product was worth the effort and we devoured every ounce of the food. Luckily, due to the way that the recipes were listed on the cards, I have been able to duplicate the dishes - gathering the ingredients myself from the grocery store. I did email Blue Apron regarding the missing ingredients, which had I not had a sweet potato, soy-sauce, honey or the ability to think on my feet, would have messed up two of my three dishes. They offered me a $10 credit, which I guess is nice, but when you think about the $60 that I would have spent on the three meals, didn't seem to quite balance it out for me. With all of this in mind, I wanted to try out Green Chef to see if I would possibly have a better overall experience. The Green Chef box arrived on the date I requested and I was pleased to find compostable insulating material instead of the silver material from Blue Apron - more eco-friendly, yeah! This made me happy...until I started unpacking the ingredients. To my dismay, there was even more packaging here than with my Blue Apron box, including sauces and a couple other ingredients in small plastic containers. It was great to have everything color coded to match the recipe cards, so organizing items in the fridge was a snap, but I had heavy sighs as I thought of all the trash. Green Chef emphasizes organic ingredients, and while this is more appealing to me, some ingredients seemed less than fresh and similar to Blue Apron, started to wilt or spoil in their plastic prisons. We were happy to have a much easier time preparing the food, however, when we sat down to enjoy our meals, they left something to be desired. None of them were bad, it's just that they weren't amazing like the Blue Apron meals. Not that I was super keen on duplicating any of the lack-luster dishes, but if I did want to, I would have had to get more info from the website, making it even less likely that I would make them again. For all of this, I paid $55 since I had a $30 coupon. That means that I would have paid $85 for my three meals from Green Chef as compared to the $60 for Blue Apron. We are all busy and it is incredibly easy to feel that we don't have time to grocery shop or make great meals. I have found, however, that we make time for the priorities in our lives, and if the quality of your ingredients, food and meals is important to you, then time is made to make these things happen. I am happy that Blue Apron and Green Chef are out there to help some folks feel a bit of relief in the stress of finding recipes and shopping for ingredients, as I know these two things can be very stressful for some - so stressful, in fact, that it pushes them away from cooking altogether. I had to take a step back, though, and determine if these are good options for me - so my final words are based on my feelings and experience, and my decisions regarding these services do not have any bearing on whether it's right, or not, for you. To each his own. I am already in the habit of finding recipes and grocery shopping each week - in fact, it's part of our date night and we really enjoy going to the grocery store together! Because of this, the "convenience" factor of the Blue Apron/Green Chef service is not as essential for me as it may be for others. I have also found that I can buy the ingredients for the same three dishes myself and pay much less than what I would be charged - so no benefit there. On another note, the waste in plastic from both services was more than I could stomach. We are conscience of trash and what we consume, often choosing to purchase un-packaged foods/items and using our own grocery bags and mesh produce bags every single week. We have a small trash can in our kitchen and maybe fill it up once a week...maybe...and that includes all the trash for the whole household, including bathroom and office trash. I don't feel right using that much plastic when I don't have to.